Through millions of years, movement was part of our biological necessity.. Movement was necessary to hunt, to escape predators, to explore and to find a mate. Organisms developed a brain (nervous system) to coordinate movement as eloquently explain by neuroscientist Daniel Wolpert in his 2011 TED talk, The Real Reasons for Brains. It is only recently that we limit movement by sitting, driving, taking the escalator, or controlling equipment that performs the actual physical labor. We interfere with our evolutionary developed physiology when we reduce or even eliminate movement for the sake of efficiency. Lack of movement, “sitting disease”, is a significant contributor and causal factor in illness. It also increases the stress response, negative mood and depression and reduces cognitive activity. Take charge and reduce illness when you integrate purposeful exercise (walking, running, dancing, etc.) into your life style. Exercise is the most effective behavioral technique for self-regulation of mood in healthy people as summarized in the superb article, The Effects of Acute Exercise on Mood, Cognition, Neurophysiology, and Neurochemical Pathways: A Review, Dr. Julia C. Basso and Wendy A. Suzuki of the Center for Neural Science, New York University, New York, NY, USA. The robust research findings show that acute exercise improves mood, significantly reduces depression, tension, anger, fatigue, and confusion. In addition, acute exercise improves symptoms associated with psychological disorders such as depression, anxiety, schizophrenia, and post-traumatic stress disorder. Exercise decreases the risk of type 2 diabetes, coronary heart disease and stress-related blood pressure response by inhibiting the sympathetic nervous system response to stress. For a detailed summary, see the blogs, What is the best single thing we can do for our health and Healthy movement is the new aging. Technology connects us 24/7. Like a drug it provides instantaneous reinforcement when searching for information and sending or receiving social messages. Millennials are the first generation of digital natives who are always connected–from being jarred awake by their cellphone alarm to checking email or Facebook just before sleep. They are unlike their parents who are digital immigrants and have experienced face-to-face communication instead of virtual/digital communication. The video below, Simon Sinek on Millennials in the Workplace, offers an interesting insight of in the lives of millennials. Sweating, finger temperature, muscle tension, breathing, heart rate, posture and other body signals covertly and overtly display your emotional state. The feedback from these signals can facilitate awareness and control to promote your health. Watch my presentation, The skin you’re in and other signals “Tells” of emotional state, presented at the TransTech-Transformative Technology Conference, Sofia University, Palo Alto, CA, Oct 14, 2016. How come rampage killings occur in affluent or upper middle class communities and in rural towns with low crime rate and not in high crime urban neighborhoods? How come that most rampage shootings by a lone gunman continue to increase since the 1980’s? How come suicide is extremely high in most modern societies (e.g., USA) while extremely low in traditional tribal societies? How come the depression and anxiety rates in wealthy countries are eight times that of poor countries? How come people in countries with the largest income disparity such as the United States have the highest lifelong risk of develop depression as compared to countries with the smallest income disparity? How come babies feel scared at night? How come when people reflect back at their suffering during war it was simultaneous the worsts and the best of times? How come after 9/11 or other major crisis, suicide and crime rates went down? How come post-traumatic stress disorder (PTSD) is significantly higher for the rear based troops who suffer relatively few casualties as compared to the front line troops who engage in actual combat? How come Israel Defense Forces have a very low PTSD rate compared to the USA military forces? How come the elderly and so many people feel isolated, lonely and sad? How come the streets and parks are covered with litter and buildings and surfaces are covered with graffiti? The answers may not reside within the individual but in our pathological individualistic culture. Through millions of years of evolution, we were a clan–a tribe. And, as a tribe, we were mutually dependent and supportive. This is our biological and social DNA–we are social interdependent beings. The common theme underlying the questions above is that we are disconnected from others and our community. We are living apart from our evolutionary background where living together as tribe allowed us to survive and prosper for thousands of generations. When we are part of a community and are welcomed back after experiencing trauma, depression, anxiety, violence, PTSD, and even littering is significantly lower. 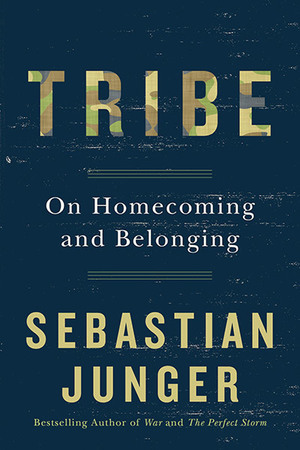 The importance of community, being part of tribe, is superbly described by New York Times bestselling author, Sebastian Junger, in his book, Tribe-On Homecoming and Belonging. This is a must read book to understand the hidden pathology created by our modern economic inequality American culture that worships the individual affluence over the common good. It suggests that we must return to our evolutionary origins, radically reduce economic inequality, work on community wide projects to enhance the common good, and actively participate in rebuilding our tribe. Being a meaningful part of a tribe can be much more healing than ingesting a profit based pharmaceutical drug for depression and PTSD. Let us support the common good over the individual increase in wealth.